Over the course of its lifespan, your garage door opener system will be subject to a great deal of wear and tear. Due to the complexity of these systems, these electro-mechanical devices are susceptible to malfunction. If your opener is acting up, our professional team will be able to identify and repair any issues so you can get on with your day. Belt, chain, and screw are the three main types of garage door opener drive systems available. For anyone willing to spend a little more for a silent operation, then belt-drive models are an excellent choice. However, if you are on a budget and noise is not a big issue for you, then the chain-drive system is also a reliable option. If you're looking to strike a balance between noise and cost, though, opt for a screw-drive system. They require hardly any maintenance and generate only a little noise. All the major brands on the market today offer specialized opener features. These vary from manufacturer to manufacturer. 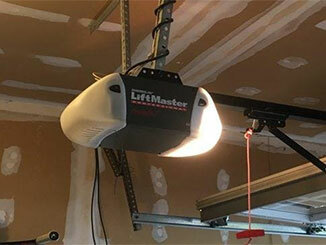 For example, Genie and LiftMaster, both use rolling code technology. This feature can help prevent your remote control opener access codes from being hacked. Every time you use the remote, the generated code will change. Other optional extras, including backup battery systems and WiFi compatibility, are also available. Make an informed choice by talking with one of our friendly, experienced professionals. It is important to service your opener on a regular basis to ensure its working to its best ability. Our service checks cover everything from the circuit board and motor gear to the trolley and rail. Should one of our team identify an issue, they'll carry out on-the-spot repairs and replace any parts as necessary. Our aim is to get your system in tip-top condition. Our technicians will also conduct a test of your unit's photo-electric eyes and realign your safety sensors to ensure your door will properly withdraw should an object block its path. From servicing and maintenance to emergency repairs, our professional team at Garage Door Repair Sun City West, can take care of all of your opener-related needs – get in touch today!